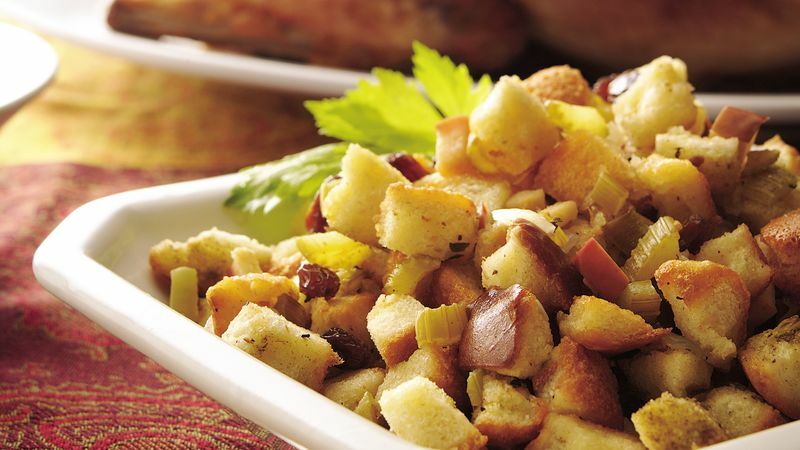 For optimal food safety and even doneness, the USDA recommends cooking stuffing separately. Heat oven to 350°F. Spray 13x9-inch (3-quart) glass baking dish with cooking spray. In 4-quart Dutch oven, melt butter over medium-high heat. Cook celery and onion in butter 4 to 6 minutes, stirring occasionally, until tender. Add remaining ingredients; stir gently to mix well. Spoon into baking dish. Cover with foil; bake 25 minutes. Remove foil; bake 10 to 15 minutes longer or until center is hot and edges are beginning to brown. For optimal food safety and even doneness, the USDA recommends cooking stuffing separately. However, if you choose to stuff poultry or game birds, it’s necessary to use an accurate food thermometer to make sure the center of the stuffing reaches a safe minimum temperature of 165°F. Cooking home-stuffed poultry or game birds is riskier than cooking those that are not stuffed. Even if the poultry or game bird itself has reached the safe minimum internal temperature of 165°F, as measured in the innermost part of the thigh, the wing and the thickest part of the breast, the stuffing may not have reached a temperature high enough to destroy bacteria that may be present. Bacteria can survive in stuffing that has not reached 165°F, possibly resulting in foodborne illness.